We excuse YouTube taking down recentlies initial program. We are rebroadcasting the entire card tonight beginning at 4 pm pst. 12-CHRIS MARTIN vs YAHIR PATINO (Main Event). 11-ROBERTO MEZA vs SAUL BANOS (WBF Title Fight). 10-KEVIN TORRES vs JORGE BRITO (WBF Title Fight). 9-RAFAEL RAMIREZ vs ALEX VALLADARES (WBF Title Fight). 8-ARMANDO TOVAR (Back from retirement) vs HUGO MONTOYA. 7-DILAN MIRANDA vs LUIS MARTINEZ. 6-ERICK ESTRADA vs SANTIAGO LOPEZ (Debut). 5-JESSICA JUAREZ (Debut) vs VERONICA CRUZ. 4-ELVIS RODRIGUEZ (Debut) vs IVAN ORTIZ. 3-MARCO GERONIMO vs ANTHONY GALLEGOS. 2-MARIO AGUIRRE vs CARLOS ESCOBEDO. 1-GERARDO YESCAS VS JESUS OSUNA. 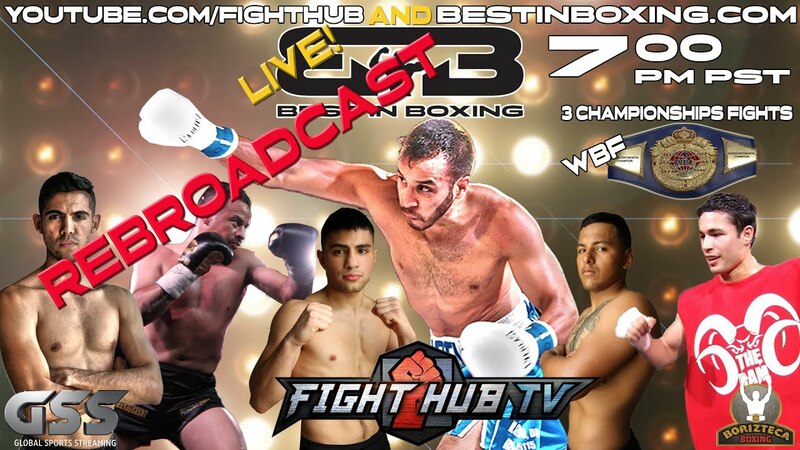 For more Boxing as well as MMA video clips log onto http://www.fighthubtv.com. Boxing video clips! MMA videos! uploaded daily! Subscribe: http://goo.gl/vnzIb. GLORY 60 Lyon Tickets On Sale Now!